The trees bare except for a solitary leaf, perhaps reluctant to let go, the rest fallen and turning to mulch, I sit in an oak wood in the border lands of England and Wales. It is three days until the solstice and I have some time alone, to be still, to reflect and to wonder. More vivid than many, the seasons this year have been rich and colourful. On a Buddhafield men’s study week we take a day out to visit Frog Mill where we are joined by Mike, Rupadarshin and Beth. The flooding had washed the bank away, the river now strewn with fallen trees. Fortunately, the bridge, which had been lifted from its site was wedged close by. Working together we heaved the bridge back into place. We cleared some areas of the wood, dragged the carcasses of substantial tree trunks out of the water and stacked them to dry, ready to heat the hot tubs and showers in the summer. Sleet blew fiercely as a small crew worked in a dilapidated old barn mending canvases, and preparing new ones. The wind was whistling under the tin roof and rattling the huge barn door wedge closed with heavy rocks. I felt a tad guilty as the hardy team got on with their work I was passing through on my way to a planning meeting. Though a few weeks later I was in the fields by the barn as we setup a make shift camp for the winter work week. I was impressed by the number of volunteers who ventured from the warmth of their homes or vans to join us, cleaning kit, waterproofing tents, painting vans, and repairing the horsebox sauna our mobile hot water unit. The team retreat at Frog Mill, with ice still on the tents in the morning, was a mix of training, planning, land work and just gathering the clan, as well as welcoming new crew, to prepare for the months ahead. We built up the banks by the bridge, weaving willow into them for strength and to hopefully avoid losing the bridge in future floods. More wood was fetched, cut and stacked, repairs to the domes and training in how to put them up. We had a day’s training on food hygiene and safety, our professional trainer excited to be in a field, having spent 20+ years in the military, more commonly he was in restaurants and corporate settings. We met by Southampton train station, loaded our bags into the freshly painted (though frankly still quite battered) van affectionately known as Peggy. We walked down to the harbour and caught a ferry over the estuary to Hythe, and began our walk through the New Forest. Each day we would walk between 10 and 16 miles. Meantime the team drove ahead with our kit and set up a kitchen and toilet facilities. On the first day of walking the forest was still in its bare winter guise. Each day as we progressed, the buds on the trees and the bluebells opened a little more. We walked in silence stopping every hour or so where we formally ended the session and sat enjoying conversation, quiet reflection or the beauty of the land. After a few days, I noticed my relation to the land changed and I felt more a part of it, part of life on earth, not separate from it and a kinship with our ancestors who have walked this planet and heard in their hearts a sense of mystery and awe. I felt connected to the refugees walking to escape the horrors of war. I felt a sweet sadness imagining them with children and the elderly and little of the comforts we enjoyed, like suitable clothes, footwear and warm food waiting for them. We walked the ancient paths to Stonehenge and then on to Avebury stones. By now the buds had become fresh green leaves. On the final morning, as we gathered in our traditional circle amid the stones to check out, two buzzards soared above and were soon replaced with a paraglider who came to land right next to us. There was a short break after the Yatra as we set up for the Total Immersion retreat, a month-long silent retreat and one of the highlights of the Buddhafield season. In amongst the trees at Easterbrook we sat in meditation, or sat in silence watching the trees and stars. We held rituals in the woods. The teaching from Kamalashila and his team was excellent. It is hard to find words for the beauty and richness of quiet mind. I had never been to Glastonbury festival before. Much as I love the Buddhafield festival I didn’t imagine Glastonbury was my kind of thing. Two hundred thousand people in muddy fields: yes it was muddy, the worst on record some say. I was going as it is part of Buddhafield’s main activities. We have been there for over twenty years, teaching mediation and serving vegan food. It did make me think our modest festival of 3,500 is a small undertaking. Whilst there, deprived of sleep, we managed to serve around a thousand meals a day and taught some four to five hundred people to meditate in our cramped space. I recall seeing people with tears in their eyes after meditating and expressing their gratitude. From Glastonbury we drove to our own festival site, green fields and a good night’s sleep. In the morning, having packed the tents away wet we had to immediately get them up again to dry. 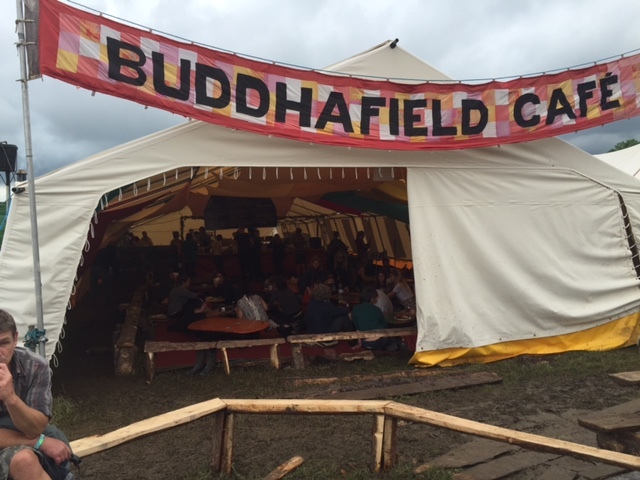 Two weeks before the Buddhafield festival we were a dozen people most recovering from the challenges of Glastonbury. Gradually more crew and volunteers arrived. Each evening we would have an activity, a couple of short talks on the values that had brought people to these fields, perhaps meditation or a ritual or sitting around the fire singing and talking. This year’s festival was one of my favourites, the site looked fabulous, the music was great and I loved having so many people come to my workshops both Mindful Communication and Skilful Flirting, I look forward to 2017. I was away in August, so missed the Village retreats and the Summer Open. I returned for the Green Earth Awakening Camp. It was magnificent to once again be in a field with a team of people creating something of significance and beauty. Feeling the wind and hearing the trees standing beneath the stars. Wow, what an event! I was responsible for the rituals and was supported by Ruth who helped create a magical central shrine. 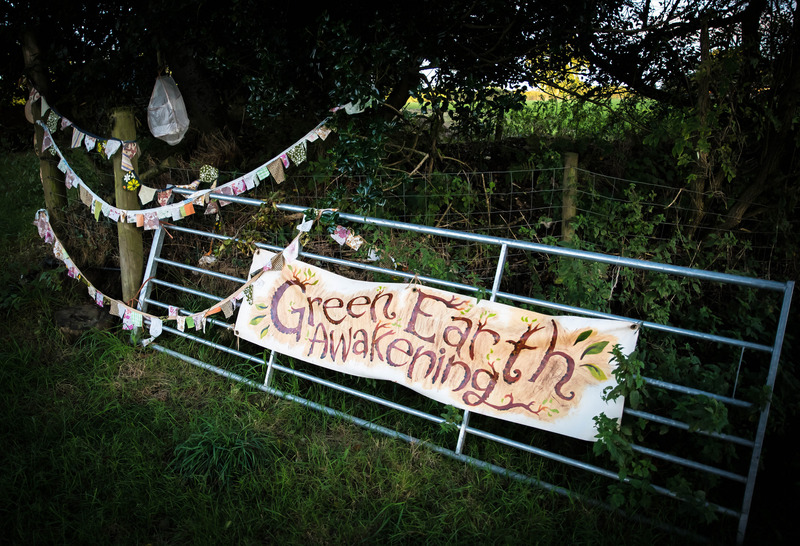 The Green Earth Awakening is all my favourite bits from the festival brought together. Lots of spontaneous and interesting conversations, brilliant workshops, play, singing, dancing, discussion, idealism and crafts. 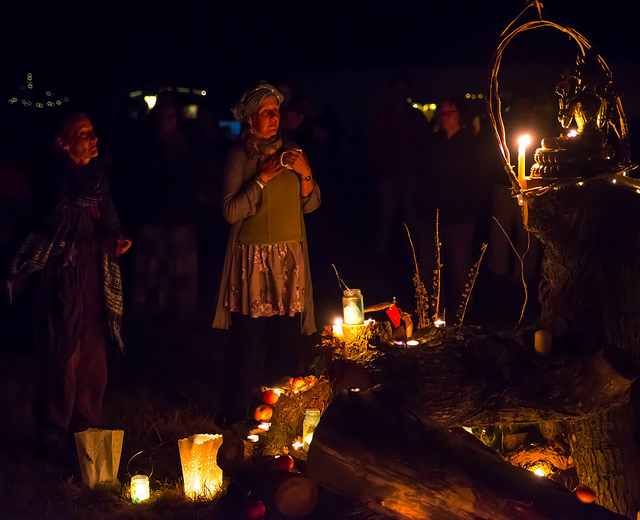 If I had to pick a moment from the year, it was doing the main ritual on the Friday night, in a large circle, we danced, we chanted mantra, made offerings and we watched in awe as a beautiful full moon rose through the trees. Once again I felt a kinship with the ancestors as we try and rekindle a sense of the sacred, a deep sense of connection and reverence for life. After three years of wandering I have now moved into a house, a modest rented place in Devon, to help establish a new Buddhafield community. The vision is to create a strong base to enable us to do more and to also go deeper in our own work and transformation, to live more fully with respect for each other, and the planet. May your life be blessed with friendship, meaning and love. May you heart unfold to its great potential. May I see you in a field in 2017, and may we cultivate the roots and buds of transformation both of ourselves and this suffering world. 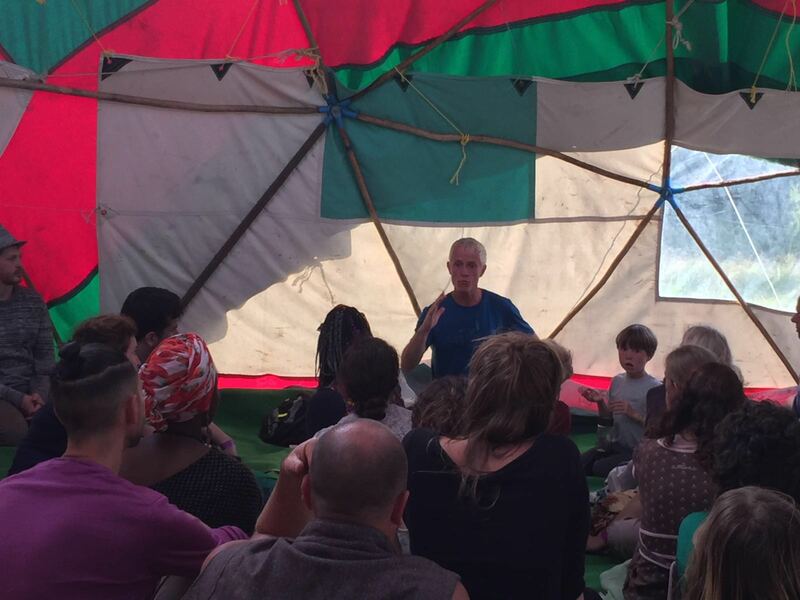 2016’s Green Earth Awakening Camp was a huge success. We had fantastic talks from Mac Macartney, Satish Kumar, the Ecodharma team, Kamalamani and Mindfulness4Change to name just a few, some of which were recorded for you to enjoy again. The atmosphere was perfect with sunny days, cosy nights and fire side dancing to a full moon. 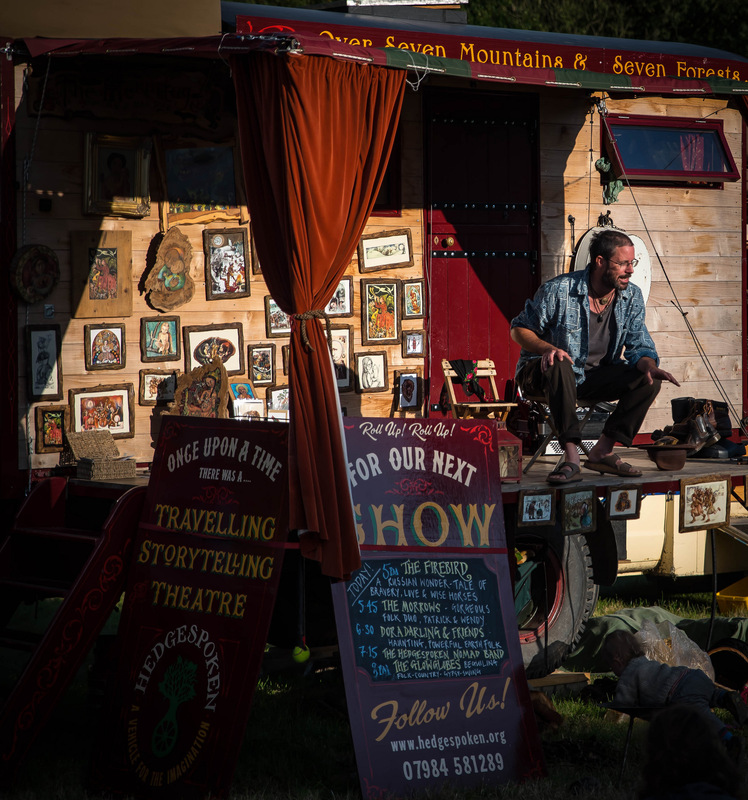 We had Hedgespoken provide their unique traveling theatre stage with story-telling and beautiful music. There were powerful rituals such as building a life cairn memorial to extinct species and our closing ceremony. For this, we joined together in a vast circle to close the event while Oak Clan Forge blacksmith Simon Summers buried a sword forged from metal found on the land as a gratitude to past and future resources. Next year’s Green Earth Awakening will take place from 20th to 24th September 2017, with the theme ‘Embracing Simplicity’. Bookings are now open – see you there! 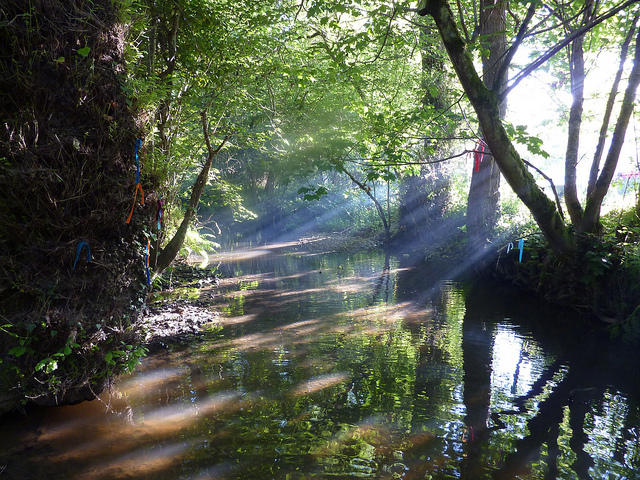 On 20th May 2016 Buddhafield are holding the annual Total Immersion month-long silent retreat, ending on 17th June. I caught up with Kamalashila to ask him a little more about what the retreat is all about. How did Total Immersion retreats come into being? The original Total immersion retreat was held at Dhanakosa [Retreat Centre in Scotland] led by myself, Vessantara and Viveka in around 2005. I thought it would work in Buddhafield and we started the following year. I have led them ever since. Some years ago Paramananda got interested and we started alternating years. What are the benefits of retreats that are held in a natural setting? If you live in nature, nature teaches you how to be natural. We come out of a highly artificial world into retreat. There are few straight lines and flat surfaces in nature, and it is not designed for convenience. This means we have to be much more aware even to live a simple life. There is an element of freshness and spontaneity that is unique. All these things generate the very best conditions for meditation reflection and generous behaviour – with the right teaching setup I think retreats in nature can even be better than a dedicated retreat centre. What effect does spending such a long time in silence have? There will still be verbal teaching, questions and ritual chanting, so the silence is not absolute. But… Peace. Clarity. Confidence. Love. Silence doesn’t mean we don’t communicate or look at one another. We get to know one another deeply by relaxing in each other’s company. Are there teaching elements to these retreats? How do the retreat leaders support people’s own self-reflection process? There’s a main daily teaching and question-answer session, as well as smaller, more off the cuff teachings throughout the day — plus of course one-to-one practice reviews for everyone. Do you have any advice for people who are considering coming on the retreat but haven’t done a silent retreat before or haven’t spent such a long time on retreat before? For most practitioners, longer retreats are easier, simply because there is more time to settle in and to relax with everyone in the community. But it’s also possible to come for just the first two weeks. What surprises you the most about the Total Immersion retreat? That every year, Padmapani manages to upgrade even further his already incredible Naga Shrine. When we first started it was a little booth on a plank next to the stream. Last time I was there it was big enough for the entire retreat to do a puja right in the river itself – and the shrine itself was extraordinary. Perhaps not actually surprising (I know Padma very well) but definitely amazing. Even after all this time leading these retreats, and with so much meditation experience, do you still benefit yourself from the Total Immersion retreat? I always learn new and deep things about the Dharma from being in a fully natural environment over time. Nature is humbling and grounding as well as being incredibly beautiful, and this shifts your whole perspective — first on the elusive ‘self’, and then on the nature of existence. Getting to that takes time though. You need to be living in one place long enough to be part of the environment — then you start to understand. Usually we are external observers and that doesn’t teach us much that’s useful. What one learns is not information – which we already have plenty of – but about what we are and what our place is. You’ve said a little about the difference between Buddhafield retreats and retreats at Centres – can you say any more? i.e. What does Buddhafield do differently and why is it worth people engaging with this different approach? I think the previous answer applies here too. It is about being immersed in nature to the point where you realise you are part of it. And Buddhafield crews know from long deep experience of living on the land how to support everyone to do that. Their expertise and ingenuity is very impressive. What do people tend to experience moving from the Total Immersion retreat back into daily life? What benefit does an extended period of meditation such as this have on people’s day-to-day life in the modern world? People will vary but most will experience a lasting boost to their clarity and confidence. Leaving the beauty of retreat may be a bit challenging for some, but even that is educative and in the long term will make our lives more authentic, natural and real. Bookings are now open for our Total Immersion retreat for both two week and month-long options. The retreat starts on 20th May 2016, with the two week option ending on 3rd June and the whole retreat ending on 17th June. I firstly would just like to apologise for not writing anything on this bog for such a long time. I have ideas and things to say but then find that I don’t prioritise it in the way that I do for so many other aspects of the work I do with Buddhafield. If I am completely honest I think that quite a lot of this is fear based as well. Putting myself up on the screen is somehow massively exposing but what do I write for if it isn’t to reach at least one person heart? I intend to be a bit more involved with this blog and my invisible audience this year and I want to do this to create some kind of hearth, or heart to draw all the people of Buddhafield together; through my stories of the glories of working for Buddhafield and the miseries of working for Buddhafield. It is nothing like sitting around a real fire but the storytelling element is something so necessary at keeping the idea of a hearth alive. I feel the lack of a hearth in my life, especially over the winter so this is for the follow hearth-less out there! I have thought a lot about fire over this winter and interestingly I stumbled into a talk given by two women last week in Totnes. The talk was about there adventures of living a stone age life for 6 months last year in America.The spoke so deeply and authentically of what that experience meant to them, of what is it to be human and how humanity is losing it’s tender touch. I don’t know if anyone out there has had the experience of hearing a story and knowing it to be true, knowing that you already know that thing you are being told. This talk was like that. These two women were talking to an ancestral part of me and the ancestral part of me was delighting in being given a space to hear, see and integrate into my modern life. The talk started with fire. They said that all creatures move away from fire except for humans that walk towards it, gather around it, use it, control it for warmth, light, comfort, dramatic effect! Of course!! It made so much sense to me in that moment. We as a species thrive with fire. I believe that this is one of the fundamental things that our culture lacks these days, a place to gather to tell stories, sing songs, recite poetry and to practise all these arts. It is in this telling of ancient wisdom that, in my experience, makes us not feel so alone. We all need to feel more connected to our ancestral ways, we all need a hearth to tell our stories around and we all need to know how to make and sustain fire. These simple acts makes for a more unified society, more unified communities. 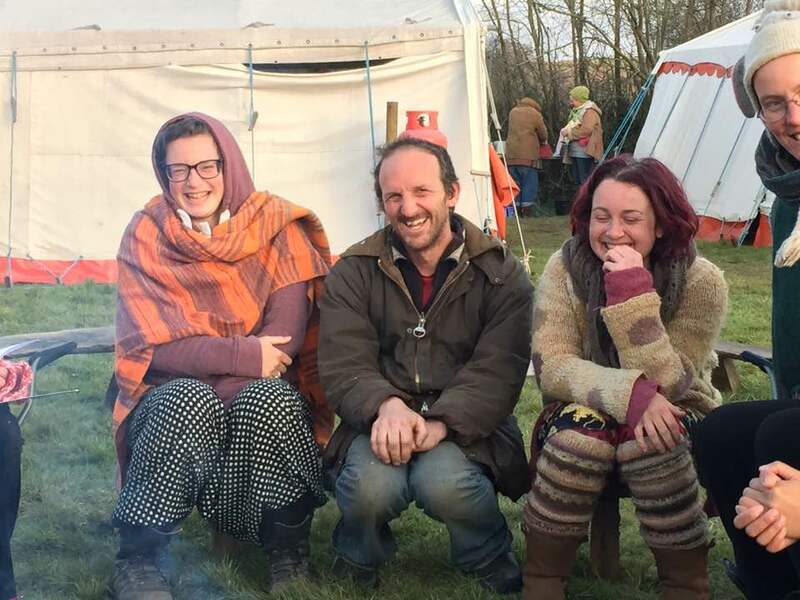 I talk from a place where I cannot easily make fire in the winter months and it is one of the things that I look forward to more then anything else when the summer and the Buddhafield circus rolls into the fields. Gathering around fire was the best thing about last summer, the songs the spontaneously arose during the Green Earth Awakening during the long July nights and at the end of the summer laying beside a roaring fire, wrapped in blankets in early October, after a month of focused inquiry leading to blissful understanding, underneath the clearest of night skies. The sense of completeness was unparalleled. I felt deeply connected to the land and humanity. Last Summer is all a memory now and the coming season is getting more and more present as everything starts to gather more energy. Sitting around fires has never been such a real thing for me and I offer it to all wish to deepen the warmth in there hearts. Becoming one with hearth and not hearth-less. In in the last few months I think I have felt into my emotions more deeply then I ever have before. I am coming up to my second year of working with Buddhafield and feel as if the last two years of my life have taught me immense amounts about my capabilities, about trust and faith, about exploring my inner landscape. I feel both intensely vulnerable and mighty at the same time. I have cried more then I coud ever think possible. Not just a few simple tears but sobs that have the full force of my body behind each, slow and deep. They have me clawing at my skin to try and escape the pain of it, I imagine trying to massage my heart to try to sooth it. Each sob has a complex story behind it, shed, and wiped away in a matter of seconds, resulting in a very wet face and what feels like new but also very old eyes. The energy in the aftermath that this provides me with, the utter sense of peace and resolve after such a consuming action is incredible. I have witnessed others in this same state and I have willingly waded into the mud with them to offer then a shoulder to cry on and a body to lean against. I am so thankful to be people that have provided this for me. To cry in front of a room full of people is something that I would never have put myself through before coming to Buddhafield, I am like a cat taking itself off to die peacefully under a beautiful hedgerow that used to be such an exciting playground. I will take myself away to cry my unrestrained tears and the worst thing for me is to expose myself openly in front of others. I want to keep the depth at which I feel things secret, something I keep only for myself. The process feels so sacred to me. Sangha, though, takes me out of my comfort zone because of the ability that my sangha has to just simply see me. I have to admit this frustrates me beyond distraction but I also feel so honoured that people take the time to even notice a tiny detail. I love the woodlands and someone that I barely know once asked me, whilst in a state of utter despair, ‘what was it like in the woods?’ Such a simple question bought this emotion to the surface even more. All I could answer was ‘peaceful’ and I still feel that peace today. The ability that this man had to notice something about me I find so comforting. 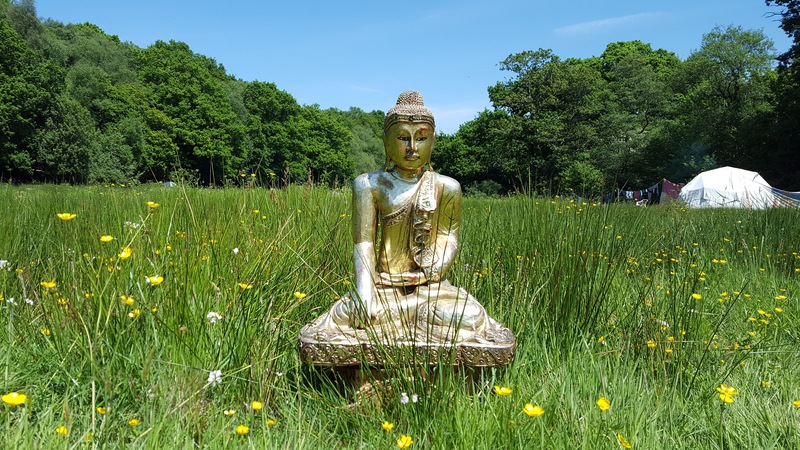 Buddahfield is a massive sangha and it doesn’t seem to matter how new or old you are there is just an acceptance and a friendliness unrivalled by anything else. This extends to all the temporary communities I have come into contact with through the retreats that I have been on and the retreats that I work on. There is just a simple understanding that you are like me and that is something that I embrace however out of my body I may appear or seem. My smaller sangha within Buddhafield is beautiful, supportive, exposing and at times utterly uncomfortable. It feels like such a paradox but the fact that I live and work with a group that holds all kinds of extreme emotion with such tenderness amazes me still. The teaching that all our lives are interconnected is something that I have been immersing myself in recently, how easy it is to forget someone or forget your own needs and how destroying it can be when you remember that thing you had forgotten. I have a strong identification with the idea that all of humanity are like mushrooms, connected by mycelium, tiny imperceptible threads and that within our own lungs, the patterns of the capilliaries can be seen in the branches of the trees, in lichen. So much of nature (including us) has repetitions of shape, form and texture. It is so easy to see ourselves as separate and more important then anything and anyone else because we think ourselves as so but to see ourselves as connected to all of those around us, to all the trees, birds, fish, is a powerful reflection. Everything is worth considering for a while and life will become something different, something more precious, robust, mysterious, at times completely ridiculous. Like the tears that come flooding out of tiny tear ducts, covering your face in water. It is essentially just water and a body in need to releasing something, to shed a skin to get to the core, to get to the essence of your particular existence at that point in time. Life is impermanent, the tears wont last, the despair, anger and joy wont last. Whatever is going on right now, that is your experience so why try to make it something it isn’t. Just let the tears flow. As the darkness of winter started to lift and during the coldest week of the year, 40 hardy, wonderful people camped out at Broadhembury to help Buddhafield create our forest garden. This was a funded event by the National Lottery and a massive boost to the work involved at creating this garden. So much was achieve in this week, and all of us at Buddhafield (and there are a lot that have had some involvement in this project at one point or another) just want to say a massive thank you to all those who came and helped. Our temporary community at dusk. Putting up the changing dome for the sauna – a perfect way to warm up and get clean on cold muddy sites! On the hill side looking out over the valley that used to be the sea bed! Dear old oak tree supporting us in so many ways! Prayer flags glowing with the sunset. Along with the actual forest garden work, Rupadarshin also needed help building his sweet track, a method of crossing bogs/marshland. It crosses a particularly boggy part of the woodland. A stunning addition to the land here, it has opened up more of the sight for comtemplation. Walk across in the moonlight and feel the ancientness!! Our next event is the Scared Landscape Yatra, a 6 day walking meditation from Goring-on-Thames to Stonehenge along the Ridgeway. For more information on this have a look on this blog for the write up from last year. To book go here. Finally the festival season ended at the end of September and the cafe and me both breathed a huge sigh of relief. It’s been good, don’t get me wrong, but it’s been tiring. Usually Out of the Ordinary in Sussex is the last cafe gig of the season but this year we were asked to cater the Young Persons Retreat. The 4th of such a thing and an annual event. 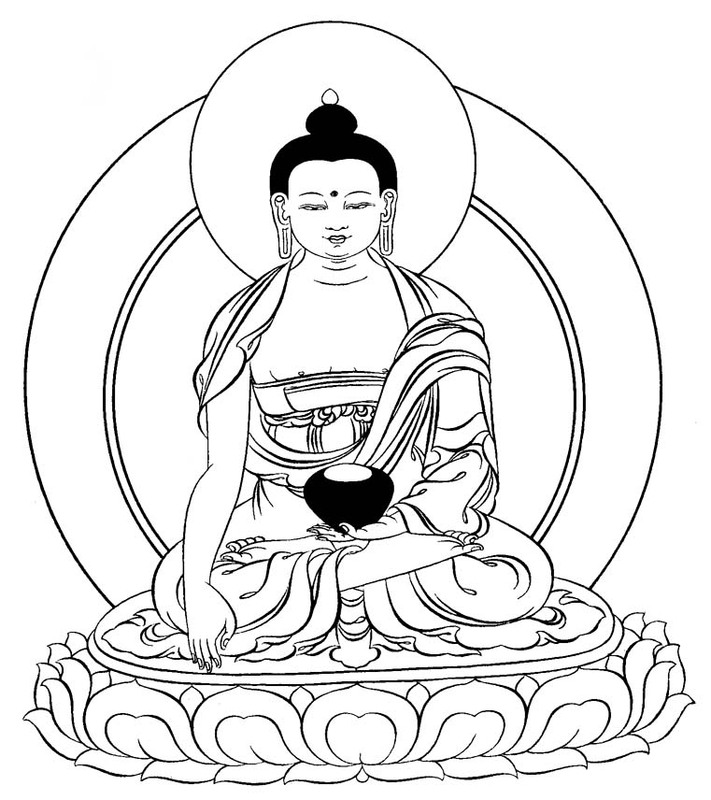 It is a place in which young Buddhists within Triratna can gather. This year Buddhafield were asked to cater the event and so it was that I had to rouse myself out of my, slowly dispersing, but still very present lethargy to travel to Uttoxeter, to an old boarding school, to prep more veg but this time in a very different context. Quite appropriately, I felt, the theme of the retreat was ‘Energy for Enlightenment’. Considering I have been struggling with my energy levels for most of the summer I was interested in what might transpire. So, here I was, inside a posh private school, feeling very out of place in such grandeur and feeling incredibly shy. It was a reluctant start. I was curious at how the weekend would pan out. How would the school gym be transformed into a shrine room, what were other young Buddhists like and what would a puja be like with so many people! The dedication ceremony on the first night was good. It was startling to hear so many voices in unison. It felt like a good preparation for the following night, puja night. It was amazing to chant a mantra for such a long time and to really immerse myself in it, letting go a tiny bit. Finding myself out of context as a Buddhist was both refreshing but provoking. I am mostly to be found in a field or woodlands. Meditating in a dome with just a thin sheet of plastic, carpet and cushions between me and the earth below. I like it this way, it gets me closer to nature and the elements. This is what I found most challenging, to see myself within the wider movement and to take myself out of the Buddhafield bubble. I took me a long time to see myself as a living, breathing Buddhist and feeling apart of Buddhafield definitely helped me in this. The connections that I have made with Buddhafield have helped me so much in all aspects of my life. Triratna however still feels slightly alien to me although I do totally respect it, I felt like I had to embrace this retreat and make those tentative links with people and order members from outside Buddhafield. The talks, all three of them, were so exhilarating. Vajratara, Singamati and Dharmashalin spoke so personally and their words are still resonating with me now. If you wish to hear the talks for yourself please follow the links below. I have been noticing more and more since these talks how energy gets blocked and misused and I how struggle with keeping my energy clear and bright. I am still thinking about the answers to all the questions that were posed over the weekend. What do I really care about? What do I need to do to focus my energy? What symbols do I connect with the most and why are they relevant, how do they help me. I might not know the answers to these questions just yet but to keep them in my mind feels important especially right now when I am searching for that thing that will allow me to fulfil my potential. The puja was just incredible. I am not sure I could put into words just how much it moved me. No one seemed lacking in energy, the room felt ecstatic, such beauty echoed off the walls, into my ears, into my heart and back out with my voice. I am glad that my curiosity was justified and I didn’t pander to my reluctance too much! Click on the links below to listen to the talks. Vajratara: Energy for Enlightenment (57 min). Singhamati and Dharmashalin (36 min: two talks back-to-back). I arrived in Buddhafield at roughly the same age as many of my Buddhafield friends are now – in my mid to late forties. It was the second half of the 90s. I was an anagarika, a kind of Triratna monastic. In my youth I had set up the west London Buddhist centre, Vajraloka (a meditation centre), and a study centre, Vajrakuta, in Wales. I lived there for fifteen years, established myself as a teacher and wrote my book on meditation. I was definitely part of the mainstream of things and a few years earlier had been named by Sangharakshita as one of the thirteen people he trusted with the future of the movement. I’d lived at Madhyamaloka with some of these people for five years, well supported, running a car, able to do whatever I wanted. I often travelled abroad, leading retreats – India, Australia, USA, Scandinavia. I led a privileged existence but I knew something was missing and I wondered if I really deserved it. Buddhafield had approached Madhyamaloka for a President, an ally and contact with the wider movement. No one wanted to do it. Devamitra, I recall, was the hot candidate, but he didn’t really seem to want to do it either, since he tried to persuade me to take it on. He thought it would suit me. I can’t remember the sequence of events, but eventually I led a retreat or two on the land, and was immediately hooked! Buddhafield drew me because it supplied a lot of what I missed. Buddhafield changed my life and I’m tremendously grateful. Not to any one person, strangely – though so many people have helped me and I owe a lot to several people, Rupadarshin for example. No, my gratitude is for the opportunity to be in nature. Just to be in nature – to have something to do there, to have anything at all to do among leaves and trees and sky – that’s what’s transformational. I learned so much about how to teach meditation just from being in the elements – from the special challenge that gives, the special conditions that are so uncompromising and real. I found a way to connect to my deepest feelings and desires, to my humnan heritage, to my ancestors – to the land itself. What Buddhafield gave me in the 90s inspired a completely new approach, led me to doing my long retreat in Tipi Valley; led me, when I lived at Trevince House with Andy, Yashobodhi, Rupadarshin, Satyajit and Abhayajit, to trying to get this land based community going that is still moving slowly to a conclusion after (six?) years. It led me to move to EcoDharma for 2-3 years, which turned out to be a mistake for me, but it was a learning experience I don’t regret. It led me to realise that I no longer needed to be an anagarika to engage deeply with the Dharma. I am so grateful for all this and I have spent my time moving between Buddhafield and the more mainstream elements of the Triratna movement, always promoting what I see as its values. I remember some of us Order members going and having tea with Bhante some years ago. I remember Bhante himself giving his talk at the Buddhafield festival and me teasing him on stage, saying he’d grown his hair especially for the event. I’ve seen Buddhafield increasingly respected; seen Bhante more recently write about the importance of animism, living a life that appreciates the living presence of non human beings like trees, mountains, badgers and birds. I’ve seen Subhuti write about the importance of the natural world, of a more animistic perspective, as part of extending and deepening the human imagination. This has had little to do with me – Buddhafield’s continued existence has simply made it easier for them to introduce these topics in a realistic, lived manner in the movement. Because it shows the ordinary people in their flats in the cities how they can be in nature. Simply that. There’s a way they can do that… There is a strong need for that. You might also say that the whole development of Festivals has come from that need – from our tragic cultural alienation from nature. Anyway, Buddhafield certainly opens a bright doorway out of the alienation of western industrialised society. I’m grateful for Buddhafield’s existence because in Buddhafield, two things I love come together: Buddhism and Nature. It so happens that these two are crucially important for our present society. Buddhism coming to the west is arguably crucial for its spiritual survival. People don’t like to appear to exclusivist, and obviously there are great, inspiring ideas and truths that come from other traditions. But to me Buddhism has something that is more alive, critical, practical and flexible. It fully fits our time. It has things to show us about our very nature as living beings that have a capacity to liberate us in ways I’ve not seen yet elsewhere. As for Nature there’s a need universally to be more in harmony with the earth, with what is natural and not artificial, and to come down from our proud, self made towers of glass and steel. This is not easy for us, and it’s not easy to see how our culture can make this transition. I’m grateful that Buddhafield makes that experiment of bringing Buddhism and Nature together. That is enough for me. There are so many applications of that, I don’t too much mind which we explore. I can see that a community on the land is a logical next step, but what I mainly see is Buddhafield’s many strands of influence in the world. Buddhafield has something truly unique. A few other Buddhist groups have their ecological approach, but nothing as lived and as experienced as this. There are many other non Buddhist groups working in nature, but no other Buddhist based ones, that I know of. In particular I see Buddhafield influencing the mainstream, as all experimental groups do. I see people in Triratna who would never camp and lie on the ground to sleep, who are slowly coming round and facing up to the needs of nature. This is an important change because contact with the land, contact with living nature, dissolves in a positive way the pride and arrogance, the hubris, that characterises our industrialised society and causes so much of the mental suffering that traditional Buddhism also addresses. Contact with the earth gives something very beautiful as it dissolves our arrogance: with its collapse comes a letting go into life that is lovely and which is liberating. To me, Buddhafield is all about that and I feel very proud, in a good way, to be associated with it. The highlight of last month was, for me, the Buddhafield Yatra. I thought it was totally great, it’s unlike everything else we do in Triratna and I would like to share an account of it with you – if anyone wanted to organize one themselves I’d be more than happy to advise. In essence a Yatra is a walking retreat; over 7 days 30 of us walked 60 miles, from Reading train station (an easy place to get to for the start) to Avebury (a vast megalithic complex dominated by the great stone circle: a fine place to finish). It’s a walk, but with a distinctive etiquette: we walk in silence, in single file, each hour of walking beginning and ending in a circle, with any words from the leader (or others, who might, for instance, have a poem to share) followed by everyone bowing to one another. The leader then leads off in a spiral, walking around the outside of the circle with everyone following. Behind the leader is a map-reader; at the rear is a backstop who ensures no-one gets left behind. Two vehicles, a van and a run-around car, stay with the day’s team of about 4 people; they tat-down the previous night’s camp, do the shopping, go ahead with the luggage and set up the next night stop, cook dinner, and welcome the weary walkers as they arrive. The car is available to pick up anyone who can’t walk the full distance. The roles all swap around, everyone plays their part. Morning and evening there’s time for meditation, Dharma talks, reporting-in and Puja or other rituals; the silent walking is of course mindful and an excellent way to practice Bhante’s ‘Four Levels of Awareness’. Almost every night we camped at one or another ancient monument or hillfort, giving a wonderful backdrop to a series of improvised rituals. The first evening we started with the Dedication Ceremony, but thereafter took off into realms of creativity. Morning by the river, with rain threatening, saw a ‘baptism’ by Air and Water, based on a Biodanza exercise; that evening another by Fire and Earth – specifically, building and jumping a fire in the woods. The next morning, finding ourselves next to Scutchamer Knob, an ancient collapsed burial mound, we surrounded it and one by one approached the shrine in the centre of the amphitheatre-like space holding a Vajra, shouting our names to the wind, declaring our intentions for the day’s walk – to “walk with confidence, sensitivity, etc”. And off we went… At Uffingdon, on Dragon’s Hill at sunset, in the howling wind, we recited the Ratana Sutta and met, tamed, and befriended our Demons, this time calling their names into the wind. 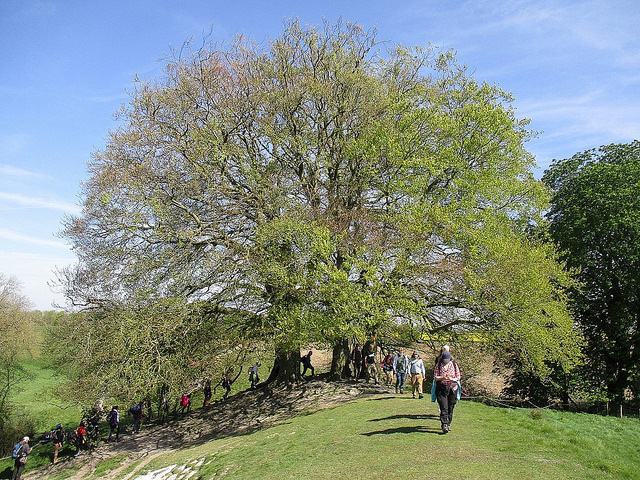 At Waylands Smithy, an ancient tomb in a beautiful beech-tree grove, we began what came to be several ceremonies connecting us with our Ancestors – those unknown people who first walked the Ridgeway and built (with stupendous labour) the many special places we were passing. We used verses and pujas by Dhiramati, to whom I’m profoundly grateful; he has such a gift with words and poetry. We began with his verses ‘To the Ancestors’; that night, by a fire in a field under the starry sky, his beautiful puja to Tara and the Elements. In the wide open space of Barbury Castle Akasaka led us in the Amoghasiddhi mantra and offering our intentions (symbolized by flower petals) to the wind. By this time Reading train station seemed a million miles and several thousand years away! Approaching Avebury, our destination, for two nights our only campsite and kitchen was the public car park and grass verge by the track: happily we were undisturbed. We’d tried and failed to find a more orthodox campsite for this part of the walk; it was clear how we as Yatrikas had in a sense gone forth from the regular world and (rather like the Buddha and his followers) been forced to take our chances night by night. Soon after our arrival we embarked upon an all-night vigil inside West Kennett Long Barrow; some 25 of us crowding in with almost 20 staying till dawn. Akasaka and I had drafted a seven-round ritual, recapping and building on the many ceremonies already performed. Each round had several stages, for instance the first, ‘Connecting with the Ancestors’ consisting of a welcome talk by Sean (a Druid as well as a Buddhist); entering the Barrow; creating a shrine and finding our places; Dhiramati’s ‘Verses to the Ancestors’ and ‘Spirit Song’; the Ratana Sutta and an offering of one sunflower seed each inside the chamber; and finally the Aksobhya mantra and earth-touching mudra. The other rounds were ‘Setting our intentions for the night’; ‘Evoking our potential’ (verses and mantras to Amoghasiddhi and Tara, ending with extinguishing all lights and holding hands in the total darkness); ‘Confession and Acknowledgement of Regrets and Limitations’; ‘Aspirations and Next Steps’; ‘Rebirth and Re-emergence’ (in the first light of dawn); a ‘Retreat Metta and Transference of Merits’ and finally the recitation of Kalidasa’s wonderful ‘Exhortation to the Dawn’ at sunrise at 5.06am. Followed by the long walk back to our camp and sleep! 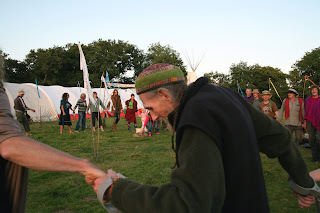 The next day saw us end the Yatra by walking the mile-long Avenue into Avebury and reporting-out among the stones – and meeting Terry Dobney, Arch-Druid of Avebury and Keeper of the Stones, for a formal welcome into and most fascinating tour of the site. Probably not surprisingly, we were a pretty strong community by this time, even though we’d all spent many hours in silence, simply walking together. Certainly we’d all lived though an adventure together, ably facilitated by the excellent Buddhafield team. For me, it was a great combination of a simple and elemental life, a whacky adventure, and a serious contribution to our great shared enterprise of bringing Buddhism to the West, even, to re-imagining the Buddha. I’m over my word count so can’t say more; but there’s photos of Yatra 2011 — Reading to Avebury on Flickr. 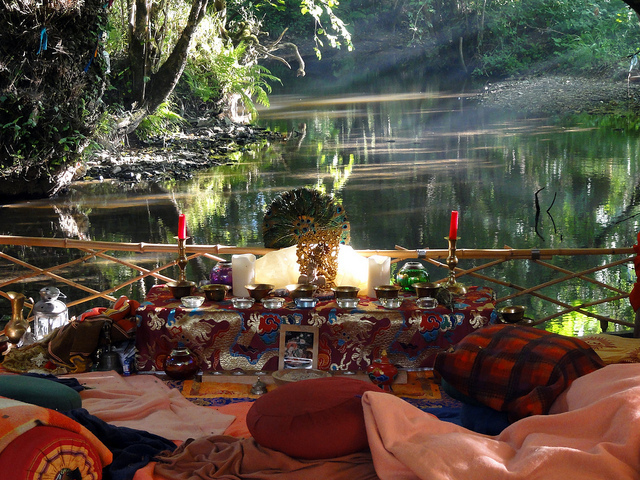 The wondrous, glorious, amazing, life affirming Buddhafield festival is almost upon us!! The preparations are stepping up a gear espeically for the cafe crew who only have one week left to get any last mintue things done before we head off to Glastonbury Festival (they are all at Sunrise Festival this week making our third cafe gig of the season a spectacular success!). I have just come back off retreat and my inspiration is flowing out of me. I learnt some valuable lessons whilst there. These lessons are about giving myself the time to do those things that bring me joy. I have learnt to cultivate more love for myself and more strength in my abilities; knowing that I am capable. This has left me feeling so abundant in my skills and in seeing the abundance in nature that is all around me. Now whilst I am pottering around in an empty house, a moment (or couple of days) of peace amongst festival chaos, I have a contiuation of this space to expand my feelings of abundance, what that means to me and how to bring this feeling with me into the festival. The theme doesn’t refer to material wealth or material possessions. It is not about that craving we all get for something shiny that costs an arm and a leg. It refers to celebrating the bountiful world around us, thanking the earth for her treasures, thanking each other for the love and support that we all receive in one form or another. It refers to the warm fuzzy feeling we get when we make someone laugh. Its about our inner goldness and not about desire for a lump of yellow rock! We conducted a survey at the beginning of the year to get your opinions of the festival and one of the points that came up was that Buddhism had got lost inamongst everything else so this year we are putting more focus back onto our rituals. 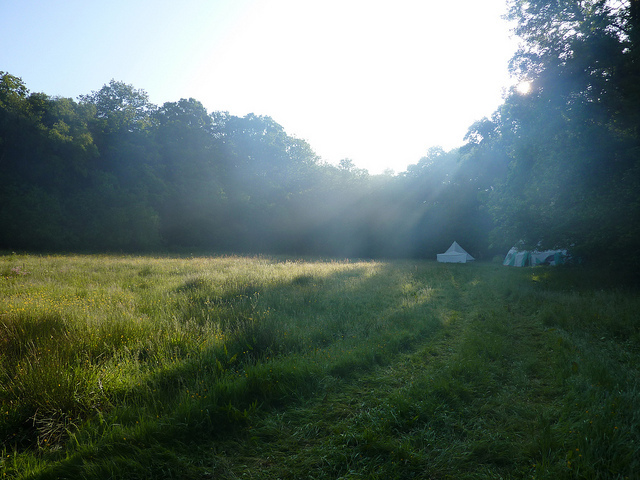 We are turning sound systems off in the Owl field during the main rituals which are: Opening Ceremony: Wednesday 6 – 6.45 pm, Saturday Ritual: 9.30 – 10.30 pm and the Closing Ceremony: Sunday 2 – 3.15 pm. Dayajoti is leading the Rituals team this year and is keen for us all to come together as one big community, to explore the festival theme as an expression of our shared values. To express our inner goldness the main symbol this year is gold, so the team are encouraging everyone, and you, to bring gold clothes to wear at any time during the festival but particularly during the rituals. If you have gold clothes then gold body paint will do! So for this years festival, give up those material cravings, give up listening to the stories that go round and round about someone being better then you and come to Buddhafield festival, to explore and express yourself in a supportive community of wonderful people and where every person, tree, bee, blade of grass, bird and string of bunting is amazing! into the sphere of your clear regard. I praise friendship embarked on suddenly as a bus that arrives. I praise friendship maturing like a tall beech tree. I praise the differences that define us. as well as what I am.